Its all over now, a huge success and a good time was had by all. HUGE thanks go to the organisers, the speakers and everyone who turned out to make it yet another successful con! IPv "what? ": yeah what !!!. What's On The Cards: Security Issues Surrounding Card-based Authentication. Mobile Java programming: For fun, profit and voyeurism. UPnP NAT Manipulation: Yeah that's (U)n(P)rotected (N)etwork (P)hun. "All Your Email Belong To Us": The meat and guts. Your Games 0wn U: Please Update Me. Last Talk of the day. H4x0r (sorry Ex H4x0r) Panel: Open discussion with your speakers. Hack the flag winner. We have already got the T-shirts printed. We sacked the printer we had last year and have had Brumcon5 shirts re-printed. Costs £10 per shirt. I have just put a battery in my 15 year old pager so feel free to Pocsag me a message I'll read out the best ones !!!!! Go to the row of bus stops outside of Snow Hill Station. The stops are all well labeled. The buses available to the hotel are the 9,109,139 running about every 3 mins. Ticket cost will about £1.20. A taxi should cost about £5.00. The journey will take about 5-10 mins depending on traffic, the hotel is on the right hand side and has a distinctive look. For those driving there is a car park on site. The hotel is not far from Snowhill or New Street Station. From A38 follow signs for the International Convention Centre (ICC), Broad Street. On Broad Street continue towards Five Ways Island. Take the underpass which leads onto Hagley Road. 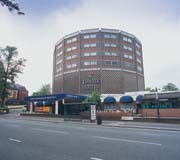 Thistle Birmingham Edgbaston is situated 1 mile on the right. There are 200 car parking spaces available at a £3.50 per 24 hours. Birmingham New Street Railway Station is 2.5 miles from Thistle Birmingham Edgbaston. Taxis are available at the station. The Register - 'We have your water supply, and printers', BBC Midlands Today - 'Spooky' and by you lot as the UK's biggest underground Hacker con. We welcome all kinds of phreaks, geeks and other technologically interested people from all sides of the fence (as long as hats, badges and warrants are left at the door). The entrance fee this year again stays at 5 UK Pounds per delegate (Again F M how do we do it ?). This year by request we are introducing a corporate pack that includes entrance, T-shirt and receipt all for an amazingly low price contact us at brumcon6@brum2600.net to book. Bus instructions: Go to the row of bus stops outside of Snow Hill Station. The stops are all well labeled.